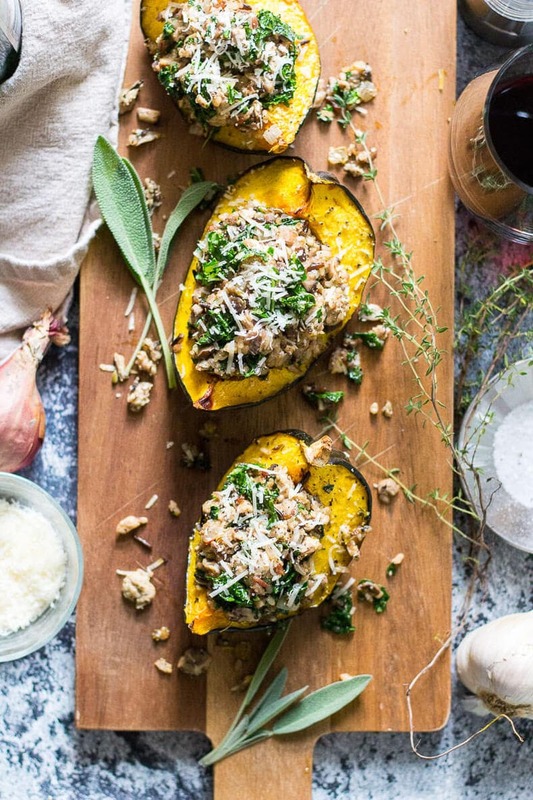 This Sausage & Mushroom Stuffed Acorn Squash is going to become your new favourite Thanksgiving main – the perfect comfort food for crisp fall days and ready in just 30 minutes! Thanksgiving: believe it or not I used to kind of hate it as a kid. Let's just say that I'm not your traditional turkey and mashed potatoes kind of gal and I have always believed in taking the alternative route to just about everything. 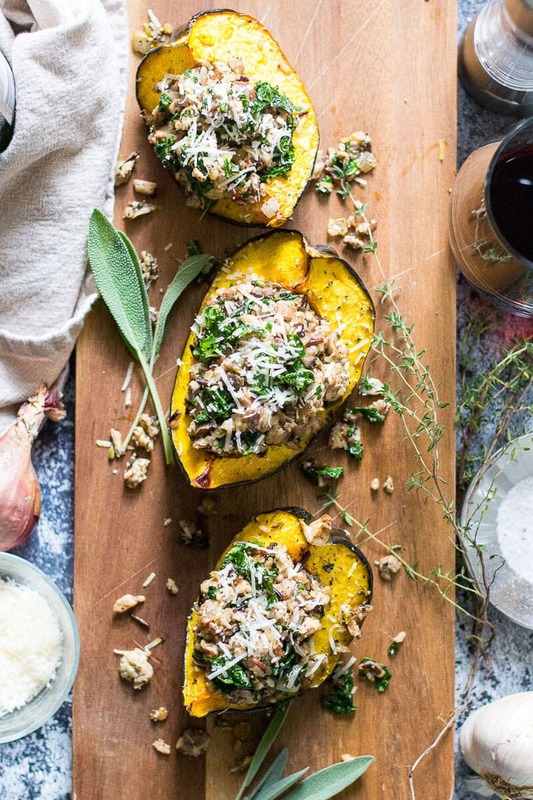 Of course, my taste buds have really matured over the years and I can now appreciate a good turkey, but you can't tell me this Sausage & Mushroom Stuffed Acorn Squash isn't calling your name. And doesn't it just scream fall comfort food? We all know what the stress of cooking a turkey and hosting multiple dinner guests can mean. Every Thanksgiving and Christmas my mom really outdoes herself and puts on a giant turkey feast with homemade stuffing, a crowd-pleasing potato casserole, oven roasted carrots, corn, peas, cranberry sauce, gravy and even more dishes I can't remember at this exact moment. It is truly crazy. I mean, it's a two-day process, and it costs a whole lot of money in food and takes an entire team of people to clean up. In the end, the food is definitely delicious and it's worth it to have the family together for some quality time, but I can't help but think that maybe the whole process could be made just a little bit easier. As a side note, I realize I'm one to talk about trying something different seeing as I JUST participated in a Friendsgiving feast with two of my good girlfriends from university, spending the day cooking up turkey breasts, potatoes, stuffing, gravy, kale and brussels sprouts dip, and this CRAZY pumpkin bread pudding. It took us literally from two in the afternoon to nine at night to get everything prepped and on the table. 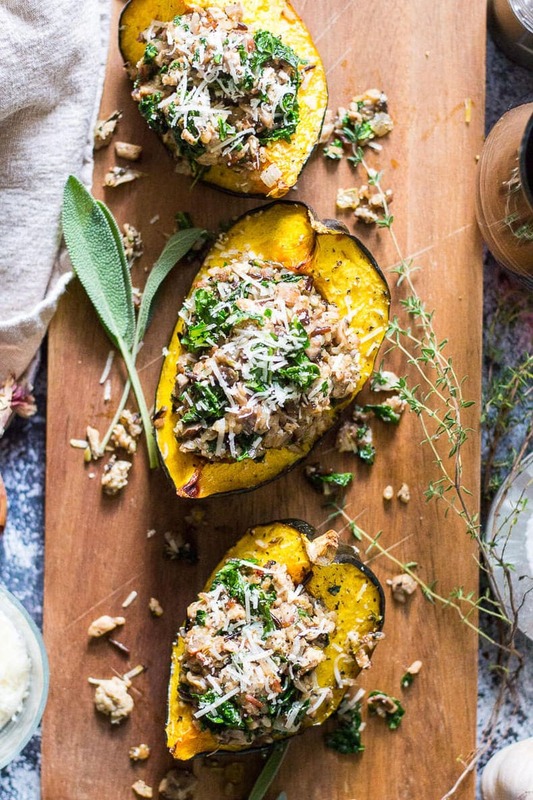 Sometimes all you need are some tasty seasonal eats (umm, hello, SQUASH and SAGE), some good company and a meal that secretly only takes 30 minutes to put together. 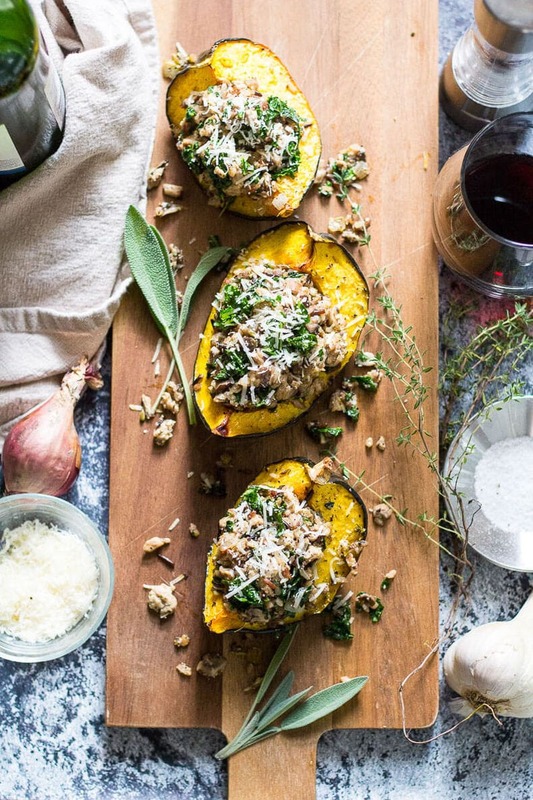 Now I know you're gonna love this stuffed acorn squash, but there's even more reason to celebrate and be thankful for this year: Loblaws is hosting a pretty sweet #HeartfeltFood contest contest, and I have a feeling that you might want in. 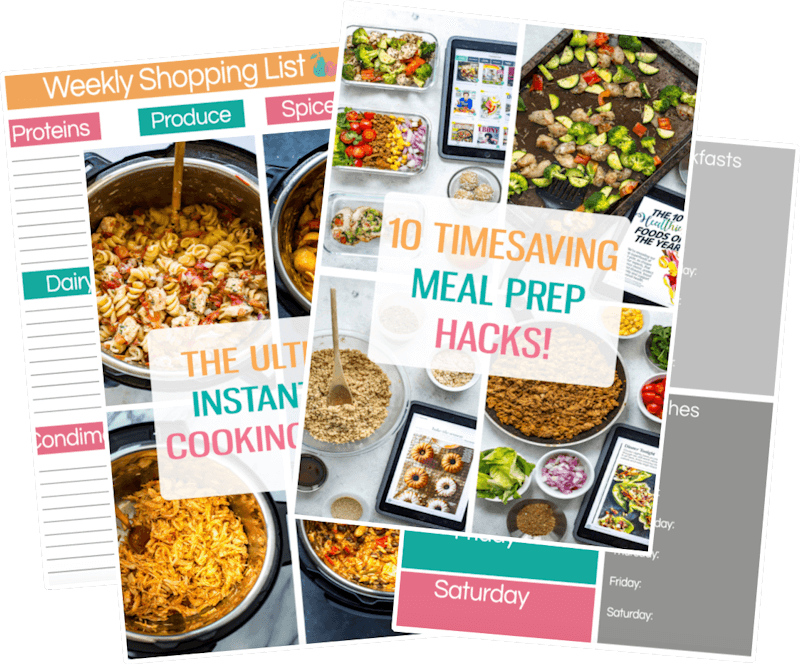 You could win the grand prize of a catered family feast for you and up to nine guests in your home, along with one keepsake culinary cookbook! So basically, you get to take Thanksgiving dinner off this year. And as if that isn't enough, there are also some secondary prizes to be won! Loblaws is giving away ten $50 PC Gift Cards in addition to the grand prize so you can treat yourself to something extra special this holiday season. 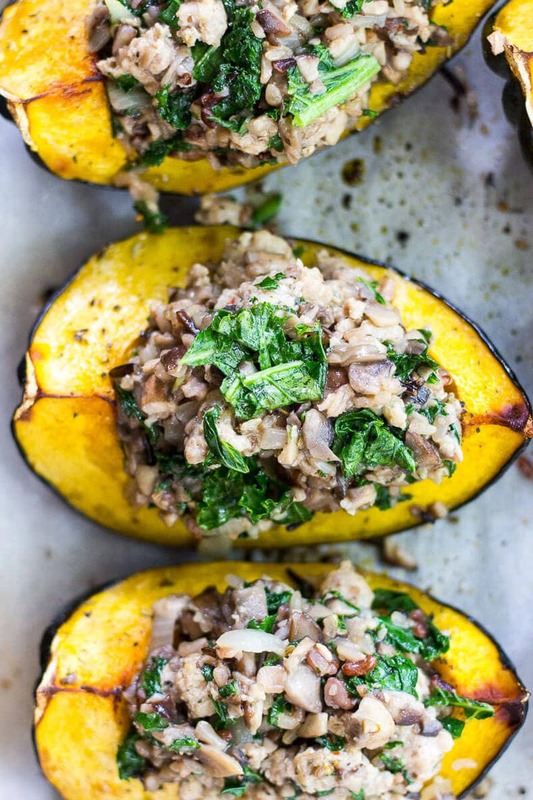 But most importantly I want to know if you'll be making this Sausage & Mushroom Stuffed Acorn Squash?! If you try any of my recipes be sure to let me know on Instagram, Twitter, Facebook or in the comments – and don't forget to send in some pictures of your family's favourite Thanksgiving side dishes! We wanna see! 1/2 of the turkey sausage mixture freeze the other half! Preheat oven to 400 F. Cut acorn squash in half, then cut halves in half (you should come out with four quarters per squash and eight quarters total). 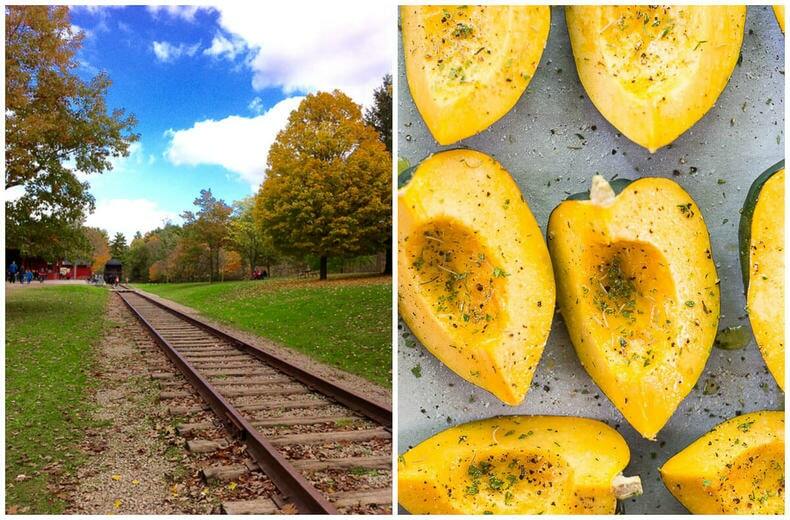 Brush squash with melted butter and brown sugar then sprinkle rosemary, sage, thyme, salt and pepper overtop. Bake in the oven for 30 min. Meanwhile, make rice according to package directions in a rice cooker and chop up mushrooms. Mix together all ingredients for turkey sausage. Heat olive oil in a large pan on med-high heat, then add turkey sausage mixture, breaking up into 1 inch pieces. Add shallots and garlic, sauteing for 3-4 min. Add mushrooms and saute another 3-4 min. Add beef broth, red wine and balsamic vinegar and simmer for 10 min until mushroom juices are mostly absorbed. Add wild rice and parmesan cheese, cooking for another 2 min. Remove from heat and stir in sage, thyme, kale, salt and pepper. Squash should be done cooking in the oven at this point so remove them and then stuff with the turkey sausage and rice mixture. 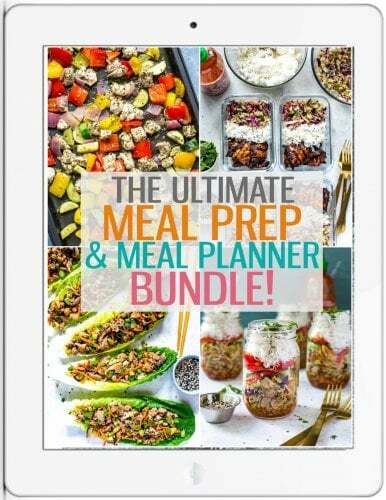 There may be some leftover - you can freeze it to use for another time! 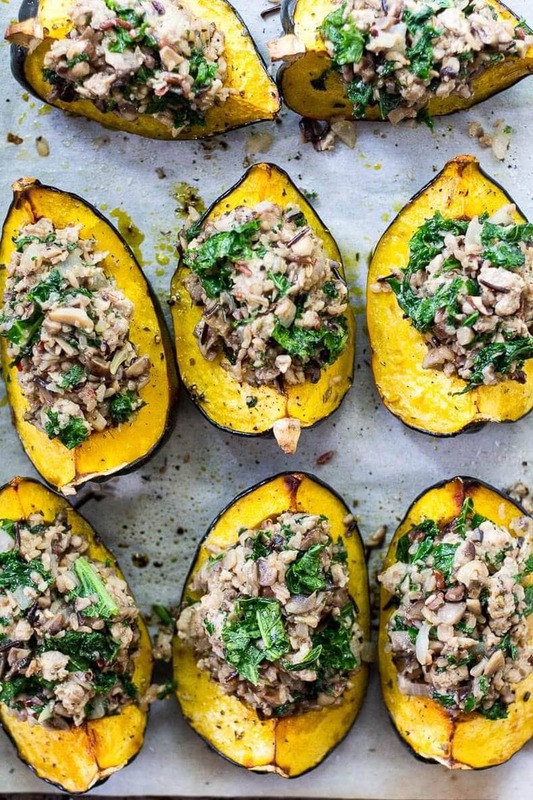 Bake squash with stuffing in the oven for 5 min, then serve! Hi, I’m not a fan of mushrooms, but I love acorn squash. Do you have any suggestions for a mushroom substitute in this recipe? Thanks!